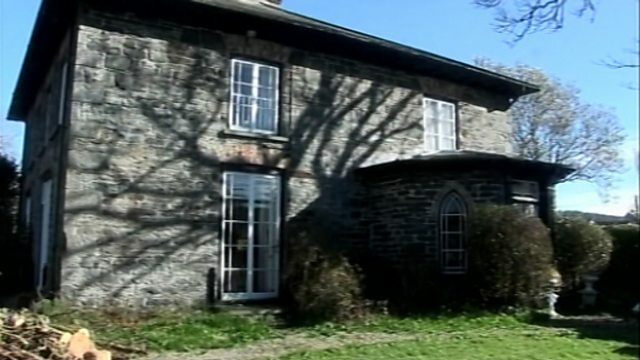 Ty'n y Lon is a Grade II listed house on the outskirts of Aberystwyth in Rhydyfelin. It's situated at a bend in a minor road just west of Capel Gosen, on a lane to Llanychaearn church. Between 1915 and 1921 it was the home of Belgian artist Valerius de Saedeleer and his family. de Saedeleer was brought to Wales during the First World War by the Davies sisters and was one of many Belgian artists working in Wales after the outbreak of war. He and his daughters taught weaving, binding and tapestry at Aberystwyth. He is said to have arranged displays from the University Collection, and may have undertaken some conservation work on items from the Collection. He also held exhibitions of his local landscape paintings in the University's Alexandra Hall. De Saedeleer was born on August 4 in the Belgian city of Aalst in 1867. He received his first artistic training at the Gent Academy of Fine Arts of Theodore Joseph Canneel (1817-1892). He mainly painted the river Lys (Leie) and the Flemish Ardennes and was one of the major figures of the first group of the Latem School. Painter, draughtsman, etcher of landscapes, mills, riverviews, snowy landscapes in the Symbolist, Intimist, Post-Impressionist style and in some paintings Art Nouveau elements. The Davies sisters are best known for amassing one of the great British art collections of the 20th Century, but less is known about the important role Gwendoline and Margaret Davies played during World War One. They are famous for bequeathing their art to the National Museum Wales, transforming its collection.But during the war the sisters, who grew up in Llandinam, near Newtown, Powys, displayed another kind of generosity, helping artist refugees from Belgium. The idea was instilled in them by their grandfather that as Calvinistic Methodists they should be great philanthropists, they should do something for their country. As well as helping, the sisters also had another motive. If they could encourage artists to come and settle in Wales it would be a great boost to the creative arts here and allow students in Wales to work with very distinguished artists from Belgium and help raise the standard of arts and crafts here.